Seattle is known for its rain. The large amount of precipitation Washington receives creates slippery road conditions and poor visibility at times. What falls as rain in the foothills and coastal regions, frequently comes down as snow in the mountain passes. Moreover, the prevalence of logging trucks and other commercial trucks heading for the port can make driving along public roadways even riskier in inclement weather. Just like other drivers, truckers are required to take weather conditions into account while driving. Inclement weather conditions may require truckers to reduce their speed, increase their following distance, and may sometimes require truckers to stay off the road altogether. Failure to do so may be a basis for establishing negligence. At the Seattle-based firm of Kraft Davies, PLLC, we represent those injured in serious truck crashes caused by bad weather on any of Washington's roads. In all serious trucking accident cases, our goal is to investigate and find out what caused the crash. If negligence played a part, we help our clients make a full financial recovery by asserting claims against the responsible parties including trucking companies and their insurers. 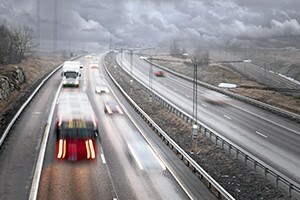 Whether your commercial trucking collision occurred on Interstate 5 (I-5), Interstate 405 (I-405), Interstate 90 (I-90), Interstate 84 (I-84) or elsewhere throughout Washington State, our experienced trucking injury lawyers are ready to help you hold the responsible parties accountable. Our firm represents clients all over the state, including in Seattle, Tacoma, Everett, Bellingham, Spokane, Vancouver, Olympia, Yakima, Shelton, Port Angeles, Hoquiam or the Tri-Cities, including Richland. We handle all kinds of trucking accident claims, and offer a wealth of knowledge to help our clients through the claims process. Heavy commercial trucks that perform unsafe lane changes, speed, or otherwise drive recklessly during rainy, foggy, icy, or snowy weather can cause serious crashes resulting in catastrophic injury and death. Even a small rain shower can create dangerously slippery conditions, such as after a summer dry spell where the rain combines with oil from vehicles has accumulated on the asphalt. While no one can control the weather, those who drive semi trucks, 18-wheelers, tractor trailers and other big rigs have the responsibility to drive safely during inclement weather. This means truckers need to make adjustments to their driving patterns based on the conditions. Trucking companies are businesses, and as such are often driven by profits. By holding trucking companies responsible for truck driver negligence, we encourage safer practices among trucking companies. Holding trucking companies financially responsible for harm caused by their negligence incentivizes increased safety, thus protecting all of us that share the roads. Our firm seeks to hold negligent or reckless truck drivers and their employers accountable when they fail to take adverse weather conditions into account when driving along Washington roads, interstates and highways. As experienced personal injury attorneys, we work with the top experts, including accident reconstructionists when necessary, to build strong cases on behalf of our clients. For more information on how our firm can help you recover compensation following a catastrophic trucking accident in Washington, please contact us online or give us a call today at 206.624.8844 for a free consultation.